Intermountain Therapy Animals Training Workshop NEW! Animals can often motivate positive differences—everything from smiles and welcome distractions to therapeutic breakthroughs—for those of all ages, in diverse settings, who are going through challenges. 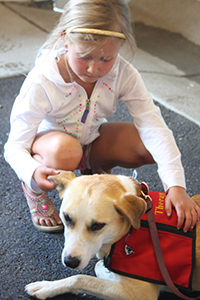 In the Helena Valley, therapy pet/handler teams visit hospitals, nursing homes, schools, libraries, and other facilities. 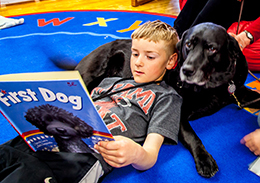 Intermountain Therapy Animals (ITA) screens, trains, and tests volunteers and their pets, who are then registered and insured as pet partner teams. Whether or not you already have a calm, friendly pet that would enjoy making visits, workshops are open to all who are interested in the potential of volunteering. This workshop is the first step toward preparing you to volunteer in this program and includes four hours of “Speaking Dog” or canine body language.